This piece explores all aspects of the tattoo culture in one of the most iconic parts of Soweto – from the tattoo artists themselves to those who just enjoy the feeling of a tattoo needle piercing their skin, permanently marking their bodies with impressions of their experiences. In the sweltering heat of the Soweto summer, a small group of people gather outside a home in Orlando West. The house is a two-bedroom, brick face building with a green corrugated roof. Apart from a small sign on the gate with a cellphone number underneath some text, one would probably drive past, oblivious to what was going on inside. Located in a back room of the house is an artist’s studio – not your typical artist, however. Opposite the door stands a bench much like a medical examination bench. There is a couch off to the left and various pictures of both designs and finished products of everything from skulls and roses to praying hands and crosses, adorn the wall. This is a tattoo artist’s studio. The artist is 30-year-old Andile Mazibuko, who has been tattooing since the age of 18. The self-taught artist used his own body as his canvas when he first began to learn how to tattoo. He started out with a home-made machine, which he still has, tattooing “laugh now, cry later, masks” on his thighs. The machine itself has the same shape as a professional machine, which resembles a mini drill or electric screwdriver, but the components used to make it could rival something that MacGyver would be able to come up with. The machine still runs and consists of a motor, adapter, an on-off switch and a sewing needle. Since then he has moved on to a more professional machine and has been using it for the last five years. Again, he tattooed himself in learning how to operate the new machine, tattooing his left forearm with a tribal pattern. SELF INKED: Orlando West tattoo artist, Andile Mazibuko, tattooed himself with a home-made tattoo gun. Amazingly, you wouldn’t be able to tell the difference between the two in terms of quality and finish. Mazibuko found his way to tattooing through his love and passion for art, and found tattooing more “common nature” when it came to expressing himself. He says he found it tough in the beginning because people didn’t really know what he was doing or what tattoos were about. However, in recent years, “Tattoos themselves have become more common and the artists themselves are getting better at what they do,” said Mazibuko. “As an artist now, it’s all about getting your work out there, so you find that guys might operate in a similar set up to mine but then also do a lot of house calls where the clients might feel more comfortable and open up more. Even though people might not have the money to spend on tattoos, we still do what we can for them and it also helps us to build our portfolios. 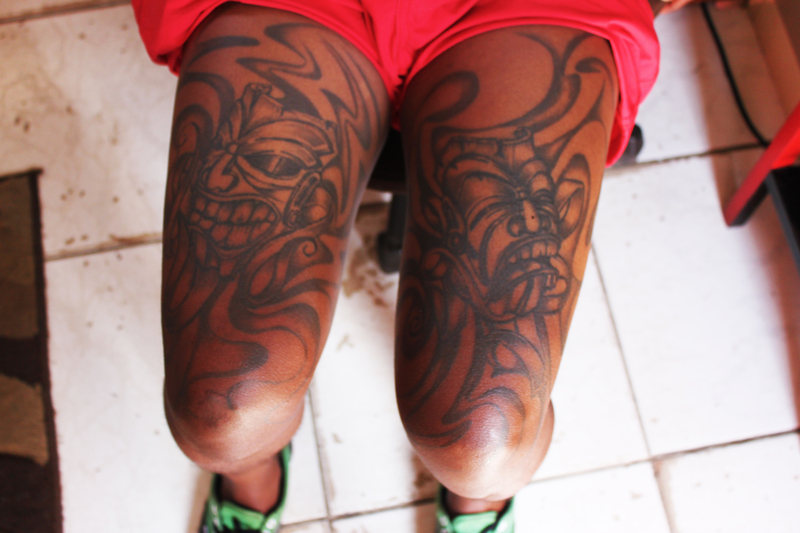 The culture of tattooing is definitely there and there are a lot of artists around as well,” said Mazibuko. On the outskirts of Orlando West is an off white-coloured shipping container with the word “Tattoos” in bold, red letters on the front of the container. This studio shares a lot with a car wash and a small food stall that serves pap, meat and vegetables. The studio belongs to a 34-year-old man who is covered in various tattoos, from a fish on his back to a cross on the inside of his right calf. Michael Ngceshe, more commonly known as “Big Mike”, not because of his stature, but rather due to his status as the self-proclaimed, “most famous artist in Soweto”, is also part of the “informal” tattoo community and has been a tattoo artist since 2011. “The reason we do tattoos is because we love to do it. We are artists, but we are different to other artists because they hang their art and we wear our art. Wear your art, don’t hang it,” he says while lighting a cigarette. While you would think that a place as vibrant and young as Orlando West might have a tattoo style of its own, that is not the case. 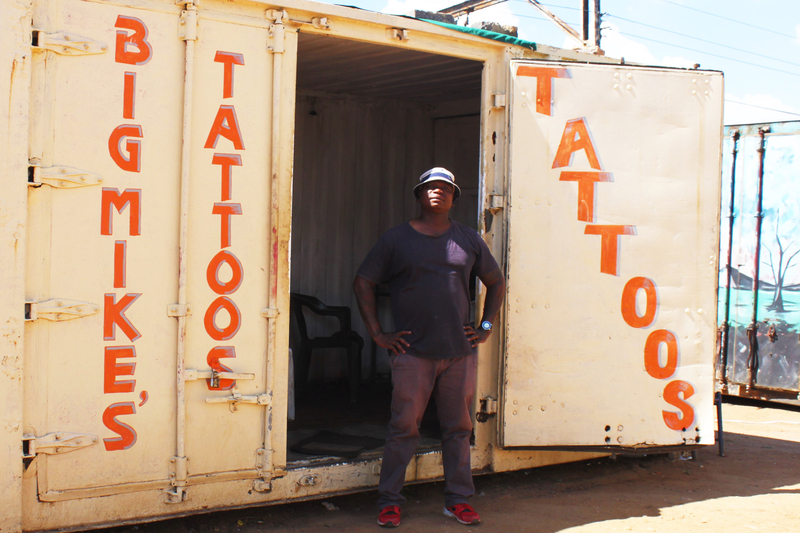 BIG MIKE: Michael Ngceshe stands outside his tattoo studio on the outskirts of Orlando West. “Tattoos are universal and so the ideas that people have can relate to a lot of other people from all over the world,” says Ngceshe. “I would say that the one thing that makes Soweto artists unique is that we cater mostly black people, so there are different techniques and other things to consider when tattooing. “The lines have to be thicker and bolder so that they can show up nicely on the skin and that takes a different set of skills as opposed to working with lighter skin. Not everyone can work with different skin types, but I think I have mastered them all,” Ngceshe says. He also believes that the tattoo industry is growing and the reason is that people are beginning to understand that they get tattoos for themselves and not for other people to just look at. “You know what your tattoos represent and it’s a way of expressing yourself or keeping those that you might have lost close to you, and that’s all that matters. You live your art in that way, because every life on earth is art,” says Ngceshe. While the culture of tattooing may be growing and becoming more commonplace in Orlando West, there is still a stigma that is attached to having tattoos. “This stigma mainly comes from the older generation where they think it’s satanic and going against religion,” said Mazibuko. It also depends on the tattoo itself and what it is. That stigma is something that Orlando West resident Tebogo Shumayeli, who at 16, got his first tattoo from Mazibuko, has experienced. “My first tattoo was all about being cool and really didn’t have any meaning, but as time went on I started getting more meaningful tattoos and ones that had more significance in my life,” said the 26-year-old. 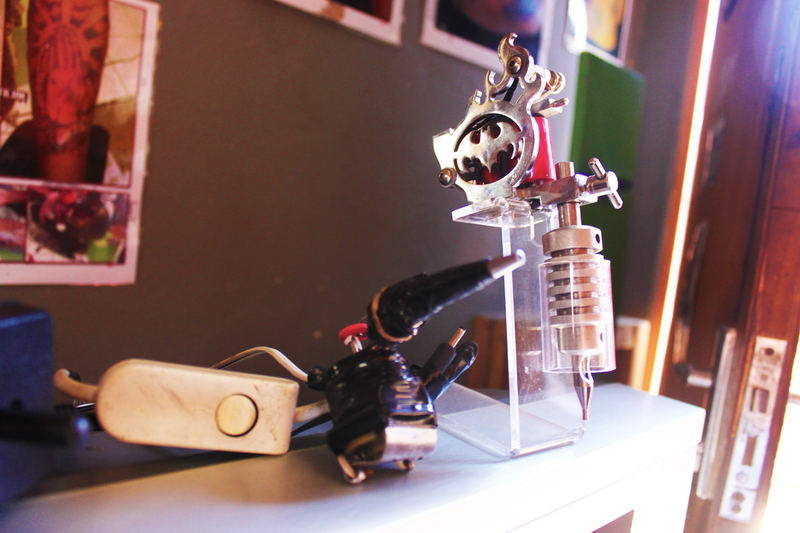 HEAVY EQUIPMENT: A home-made tattoo gun (left) alongside a professional machine (right). “I think about 80 percent of the people in this area have tattoos and they feel the same way. That’s why you won’t really find people branding themselves with logos or big names, of soccer teams, for example. It’s more like you are promoting that kind of logo and you would probably have to get paid for something like that. You find that most people think it’s quite ridiculous to get tattoos like that,” said Shumayeli. The culture of tattooing is growing in Orlando West and in Soweto as a whole. While it is mostly young people who have opened up to the idea of tattoos and what they represent, the older generation is gradually beginning to open up to the industry as well. Ndumiso Ramathe is a man who knows all about tattoos and is not afraid of getting inked. Having covered both of his arms and part of his chest, he even has a tattoo of his birth year, ’86, on his chin. Ramathe, who is the owner of Soweto Ink and organiser of the Soweto Ink Festival in Kliptown, said that he had noticed more parents coming in to get tattoos done and that some of them were even bringing their children with them. “A very small percentage of people do this, but it shows that the industry is opening up, which is really exciting to see,” said Ramathe. 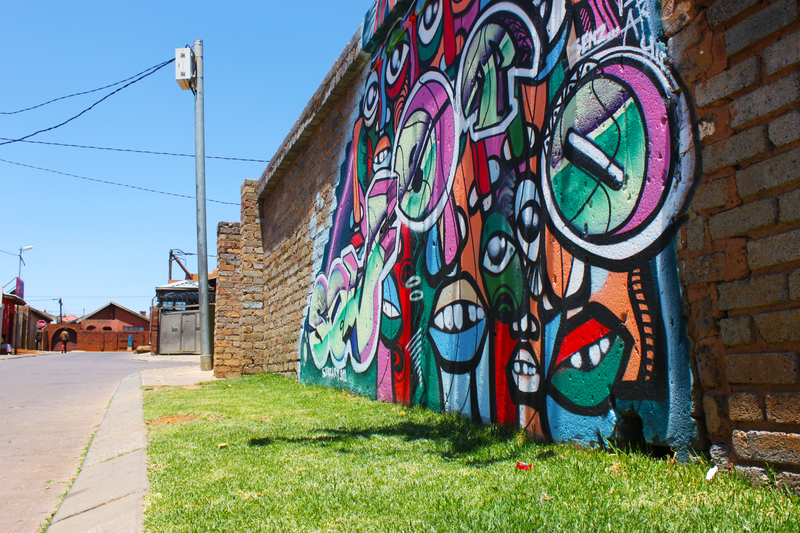 The Soweto Ink Festival, scheduled to take place in December at Walter Sisulu Square in Kliptown, is in its second year and was expected to host both local and international artists who would be able to showcase their work. “The development of the tattoo culture is slow, but it is getting there. This is why I am getting involved in conventions and festivals, to educate people that a tattoo is not something that you just get from the guy around the corner,” said Ramathe. “These conventions and festivals aren’t only aimed at prospective clients, we also use them to try to educate artists themselves about the proper hygiene and safety certificates that they have to have in order to operate and be able to get products from suppliers,” he said. Festivals also present artists with a chance to interact with other artists from different areas, not just in Gauteng, but from all over the country and to learn from each other. However, this is not always the case, with artists from particular areas, such as Orlando West, tending to stick together and those from other parts of the country doing the same. “A lot of people from here will go to other parts of the province, like Pretoria to get their work done, especially those that work in corporate, so festivals like this also help us local guys to gain exposure among our own people. Most of the guys that I work with, work as a unit, but you do get those ‘ego tattoo artists’ who make more money than others, so they have cooler studios and those guys are more business driven than us smaller guys,” said Mazibuko. The Soweto Ink Festival is a tattoo convention in a form of entertainment that aims at uniting the art with the nightlife. The convention also aims to grow tattoo culture in Soweto and other areas with a disadvantaged art background, and to put South Africa on the map in terms of art. Artists from across the country and neighbouring countries, as well as artists from countries such as Turkey, are expected to appear at the convention. The convention, set to take place in December 2017, will also feature entertainment, pop up stores and food stalls. ARTISTIC FLAIR: Graffiti on the wall of one of the many home-based tattoo studios in Orlando West. “The older folks who are into religion don’t really support the idea of tattoos and see it as satanism. Personally, I see the tattoos as body art and a way of enhancing how you express yourself,” said Shumayeli. While the tattoo community is a niche group of people, especially when it comes to the artists themselves, there is also a sense of competition between artists, in particular between those who operate in different parts of the province. “Those bigger tattoo artists, it’s like they don’t trust us to do a good piece, because their shops will often get full, but then instead of maybe referring the client to us, they just tell them to come back another time, just because they don’t want to lose out on the money”, said Mazibuko. Like many other professions, image is an important part of marketing yourself and what you are doing. Being a tattoo artist is no different. “You have to be wild and pretty out there for people to take you seriously as a tattoo artist,” said Mazibuko. “People would rather get a tattoo done from someone who has tattoos himself, especially if they want to get a bigger piece done. If they want something smaller, then its okay if the artist only has one or two, but they generally get put off if the artist doesn’t have and they want something big or elaborate,” said Mazibuko. With tattoos becoming an increasingly more common trend among a lot of people, there is a sense that our generation, might be the last to not have any tattoos. That’s the feeling of Orlando West residen,t Thandi Mazibuko. “It starts with us, going down, and people younger than us will see our tattoos and also want one of their own. I feel like our generation will also be more accepting if our kids get tattoos, because we have a better understanding of what it’s about and we have been through the phase of having a stigma attached to tattoos, so now our kids won’t have to go through that,” said Thandi. DEEPER MEANING: Butterfly and floral tattoos on Vanessa Myathaza. “The older generation still understands tattoos as being something that maybe started in prison and so it is associated with that kind of thing. When I got my first one, my mom was not happy with me, but eventually she came around. Nowadays it’s more of a lifestyle kind of thing and a lot of the tattoos that people get aren’t too hectic, so it will be a mother getting their child’s name, for example,” said the 32-year-old. “I have 11 tattoos and to me, they represent identity. Nobody can have the same tattoo as me. Yes, the design can be the same, but the meaning behind it will be different. That’s why I put a lot of thought into what I get and other people should too, because it’s very difficult to get it removed or covered up if you don’t like what you have,” said Mazibuko. Tattoos still have a long way to go to become the norm within society, but it’s places like Orlando West, with its young and edgy vibe, open-minded people and talented tattoo artists that are beginning to change the perception of tattoos and tattooing in Soweto. Having been permanently inked, the individual walking out into the sweltering heat once again, undoubtedly feels a sense of being part of a community and has a badge of belonging to show that they are part of that community.